Gauge 22 stitches, 27 rows to 10 cm/4"
Washing Washable by hand, 20°C (68°F) max/ Do not iron/ Do not tumble-dry/ Suitable for Dry Cleaning/ Do not bleach. Super Kid Silk is the ultra-soft gorgeous mohair yarn. This yarn is made up of 76% mohair and 24% silk, both of the finest quality. Super Kid Silk has a yarn length of approx. 195 m per 25 grams. Recommended needle size is 4 1/2 - 5 but you can also use thicker needles for an airier finish. It’s available in 40 beautiful fashionable colours. It must be hand washed and dried flat. 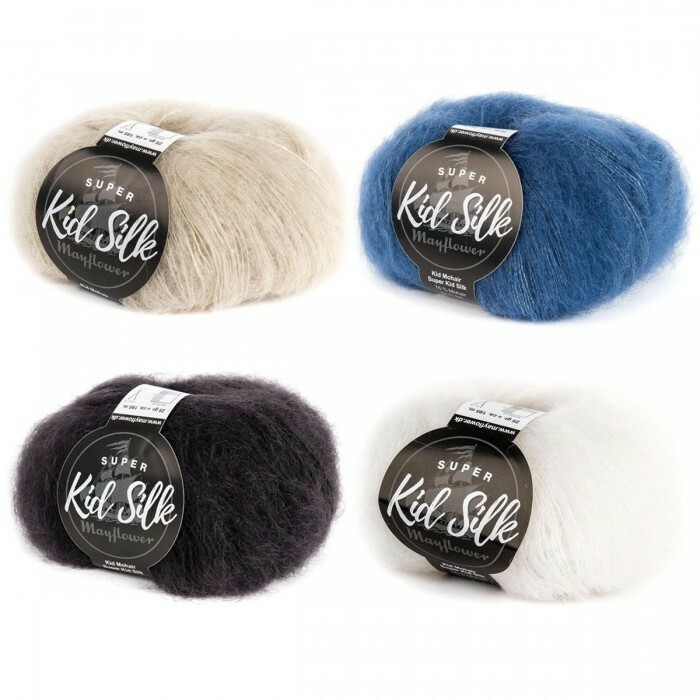 Super Kid Silk is highly usable for all types of knitwear projects like blouses, sweaters and cardigans, use it on its own as Super Kid Silk or combine with other yarn types.